So, you’ve been to Europe and now you want to explore somewhere new! There are so many amazing places in this world and you want to try something that you haven’t seen before. What about the Middle East? Dubai has been an emerging destination for travelers the past couple of years. There are so many fantastic, unique things to do and see in Dubai that AESU wanted to make sure you had the chance to go! We now offer an eight-day trip to Dubai in the United Arab Emirates. 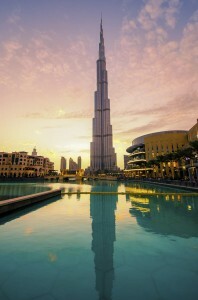 The Burj Khalifa is one of the most famous buildings in the world. It has become the symbol of Dubai, much like the Eiffel Tower of London is to Paris. Currently, the Burj Khalifa is the world’s tallest building and has been since 2010! This unique structure is 2,716.5 feet tall and has 163 floors. It took about 5 and 1/2 years to build the Burj Khalifa. In addition to being the World’s tallest building, it has the World’s highest nightclub located on floor 144, the World’s highest restaurant, At.mosphere, located on floor 122, and the World’s third highest observation deck on floor 124. This building has been featured in movies and video games like, Mission Impossible: Ghost Protocol. Do you love skiing and get sad when it disappears every year? You can go skiing in the desert! Ski Dubai has 5 different slopes that vary in steepness. They also have an ice body slide, toboggan runs, and an ice cave. Didn’t think to bring your skis and snow gear to Dubai? No problem! Your lift ticket include skis, snowboard, and winter weather clothing. None of that piques your interest? How about hanging out with some penguins? While the rest of your family skis you can go make some new penguin friends. After cooling off at Ski Dubai, you can go slide down some sand dunes. Dubai offers a vast number of activities that will surely please everyone you travel with! The feeling you get from being in a new and exciting place will unquestionably be waiting for you when you step off the plane in Dubai! This entry was posted on Thursday, November 14th, 2013	at 4:48 pm	. You can follow any responses to this entry through the RSS 2.0	feed. Both comments and pings are currently closed.